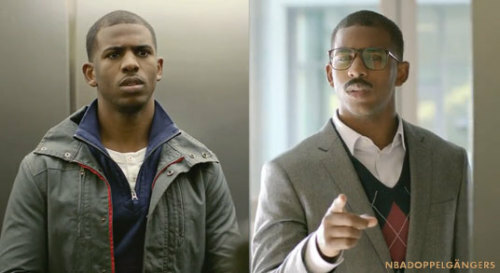 LAS VEGAS – Chris Paul and “Cliff Paul” are the NBA’s runaway leaders in the Separated At Birth Dept. Marcus Morris and his twin brother Markieff – or vice versa, actually – were reunited in Phoenix last February and spent the Suns’ final 27 games partly reminding folks of the Van Arsdale twins. But the Summer League got its own dose of doppelgangery Friday evening when Denver’s Luke Harangody and Memphis’ Jack Cooley stormed the court simultaneously at the Thomas & Mack Center. Jack Cooley (left) and Luke Harangody. Separated at birth? 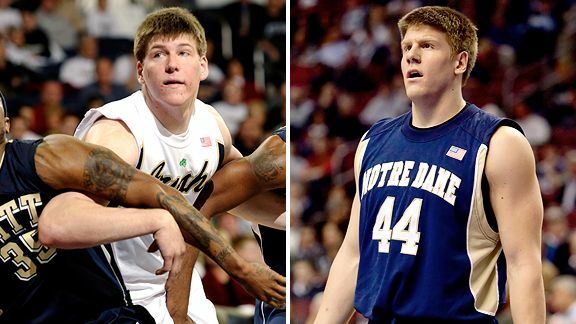 The resemblance between the two former Notre Dame big men remains startling. It has been ever since Cooley showed up on the Fighting Irish’s campus in South Bend, Ind., as a freshman in Harangody’s senior season and, in time, had those used to hollering “Luuuuuuke!” switching over to “Coooooool!” instead. Cooley is a little taller (6-foot-9 to Harangody’s 6-7), a little broader (though they’re listed at 244 and 245 pounds) and, frankly, a little paler. Harangody is two years older and was a second-round pick, No. 52 overall, to Boston in 2010 while Cooley went undrafted last month. Look, we’re not going to tread into a cultural minefield of “Big Notre Dame guys born in Illinois all look alike,” but when you factor in the brush cuts of their thick, brown hair … well, heck, look at the photos. That’s how well Cooley played for the Grizzlies squad. He opened some eyes with his jump shot and might have whipped up a job market for himself for an offer from overseas or an invitation to an NBA camp, averaging 14.7 points and 9.2 rebounds while shooting 52.7 percent (39-for-74) in six games. His numbers in four years at Notre Dame: 8.3 ppg, 6.4 rpg and an average of only 5.3 field-goal attempts. The alumni association was reciprocal Friday night. While Harangody – who averaged 11.3 points and hit eight of his 14 3-pointers – said he has “a couple nice options overseas” for this season, he too is hoping to stir up interest from the league. Cooley considers that a no-brainer. OK, but if that happens, the old clone clowning surely will rev up.